When I first found out that I would need to choose a photo to feature on this blog, I never imagined myself spending hours shooting landscapes. Normally, I tend to shy away from these types of shots because I don’t consider myself to be particularly good at them, but this photo reminds me that it pays to step out of your comfort zone every now and again. 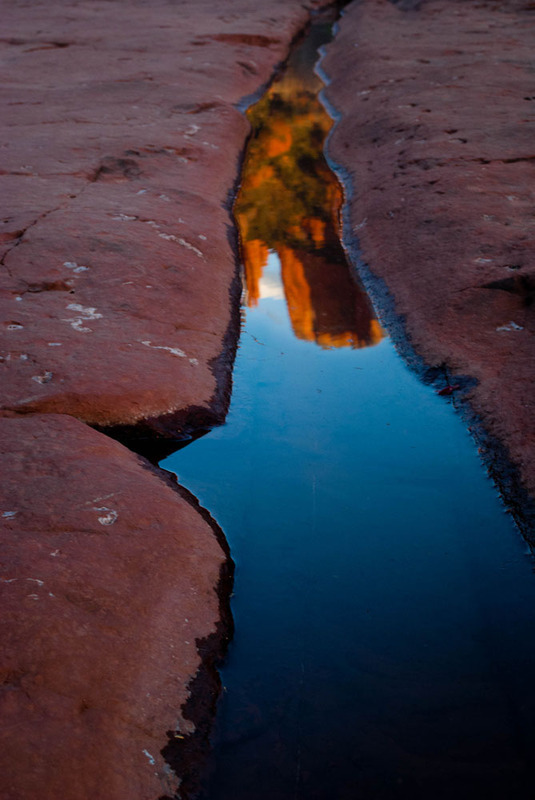 Over spring break I was lucky enough to spend a weekend in a beautiful ranch house in Sedona with an unobstructed view of Cathedral rock, and a less than five minute walk to a great spot on the creek. As soon as we drove up I was blown away and couldn’t resist wandering off to take advantage of the situation and capture every moment I could. Over the two and half days that I was in Sedona I got a lot of great pictures of Cathedral rock, Oak Creek, and everything in between, but I think out of the close to 1000 pictures that I took this photograph really showcases my viewpoint as a photographer. Usually my goal is to portray subjects in a different way than they are usually seen. This photo evolved from the classic shot of Cathedral rock that included a reflection in a small pool near the creek, but I wanted to step away from this and find a more unique image. This image was taken on the second day of my trip, and this allowed me to get more familiar with my surroundings and really recognize what was working and what needed work. Even though the weather was fantastic, which was an appreciated break from the strong winds and cold temperatures of Flagstaff, the main problem I had when shooting was the sun. It was so bright and was reflecting off the surface of the rocks and the water which kept washing out all my images.I usually keep my ISO at 200, but because it was so bright I was able to lower it to ISO 100. This filtered out some of the light that was giving me difficulty, as well as improved the quality of my image.I had made some adjustments, but luckily this day a scattered layer of puffy white clouds moved in to diffuse the light as well as add interest to the sky. I also sacrificed some relaxation time to make the trek down to the creek just before sunset to capture the golden light shining on Cathedral Rock. Because it was later in the day I ended up using a shutter speed of 1/25to let some more light in, as well as opening my aperture from about f/20 to f/11 to do the same while still maintaining a larger depth of field. In post production I mostly just increased the blacks and saturated the reds, oranges, and blues in addition to some minimal sharpening and exposure adjustments. As I mentioned before I was originally shooting the rocks and their reflections, but then I started thinking about what would happen if you took away the context of the image and only shot the reflections. This proved to be interesting because in the images that followed that thought I found that the rocks seemed to stand out more because the view wasn’t overwhelming. This perspective made it possible to simplify a seemingly complex composition, the task that usually drives me away from photographing landscapes. In this image one side of the rock isn’t visible, but it gets the point across that this is Sedona and it is beautiful. On this trip I was also lucky enough to be with a friend who is a photographer as well, and part of the fun was looking through each other’s photos and seeing the differences in what we found interesting, as well as sharing tips and advice on how to better achieve the photos we wanted. Overall this trip opened my eyes to some unexpected subjects that I normally wouldn’t spend too much time shooting, and it paid off with a lot of photographs and many lessons learned! Normally when I take a photo of an object, I like to move things around until I feel they are in the right place. 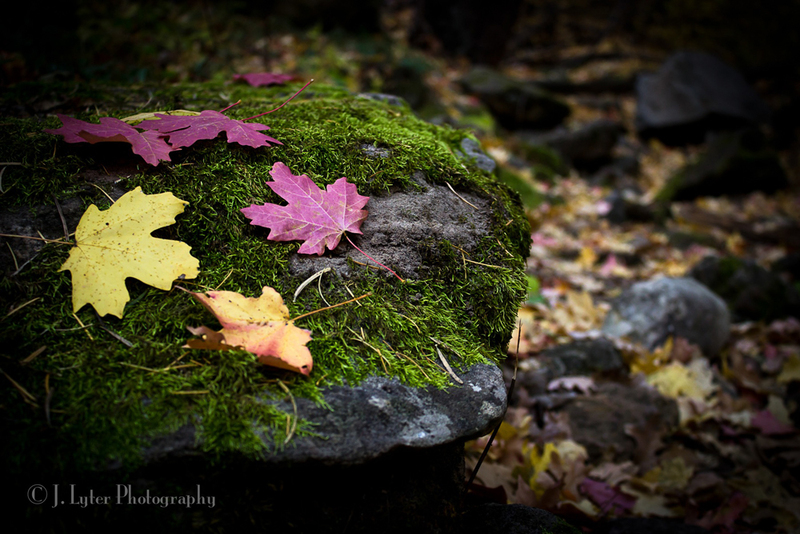 To me, the best part of this picture is that each leaf on the mossy rock is a different color, giving it a nice variety. The even better part is the fact that I didn’t put them there—it was all thanks to good old Mother Nature. I hiked down in West Fork a few months ago, and brought my camera along for a landscape assignment I was given in class. Since landscapes are my least favorite to photograph, I wasn’t’ exactly jumping for joy. Although I pride myself on being organized and focused, once I get that DSLR in my hand, all of that so-called focus goes right out the window. I took one landscape picture and dozens of close-ups of other subjects I found to be much more intriguing: streams, rocks, tree trunks, flower, basically anything besides landscapes. This is nothing new for me, and I usually find that my best images are the unexpected ones. For this particular photo, I used a Canon Rebel t3i set at ISO 400, 18-55mm lens at 34mm, F/4.5, 1/50 second. When I came across this particular rock, I snapped a single photo and moved on; out of sight out of mind. It wasn’t until I got into Lightroom that I realized how special this picture actually was. I boosted the vibrancy and contrast a bit, threw a vignette on, and there it was: the best picture I took on the entire hike. Vignettes hold a special place in my creative heart, and I tend to put them on most of my images—this one seemed to benefit from the heavier vignette in my eyes. Now this is highly unusual for me, as my favorite part of photography is often altering images until they look different than reality using wide-angle lenses, extreme close ups, and color selections. Sometimes though, all that fuss isn’t needed; sometimes less really is more. This image evokes a sort of calm and serenity in mind, especially when I think back to how peaceful the scene actually was: the early morning sunlight slowly streaming through the trees, hardly any hikers on the trail yet, and nothing but the sound of water trickling over rocks in the nearby stream. As photographers, we may think we know where props should be placed and light should be directed, but sometimes—as this image shows—nature knows best. Although video is what I primarily use my beloved DSLR for, photography is becoming a close second. Cameras are a part of my everyday life between my film production major and my work as a videographer, but it wasn’t until last year that I declared a minor—and a passion—for photography. Being able to tell a story or communicate an emotion through a single image or video fascinates me, and I love being able to alter reality with a specific color selection, crop, or camera angle. Last year I began taking senior pictures for graduating seniors, and turned it into a side project called J. Lyter Photography & Video, which has allowed me to expand my audience through social media. In the future, I hope to be working professionally with both video and photography, and as long as I have a camera in my hand, I know I’ll be happy.